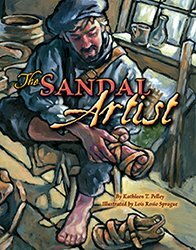 The Sandal Artist, Written by Kathleen Pelley and illustrated by Lois Rosio Sprague. The Sandal Artist is the tale of a poor young artist who discovers the beauty of everyday life. Since Roberto hopes to be a renowned artist one day, he only paints bright and vibrant scenes. He refuses to paint images of the poor children playing or old Stefano and his donkey. But one day, when a cobbler lends Roberto a pair of sandals and whispers that they may allow him to see the world in a new light, Roberto learns to find grace and beauty in unexpected places.